"... the final arrangements for the Leeds Musical Festival, to be held on October 12th to 15th next, have been disclosed, and the programme, including as it does several novelties, is of a standard which should worthily maintain the musical traditions of the city". A new work that was to be performed at the Festival that year was Ralph Vaughan Williams’ A Sea Symphony for Soli, Orchestra and Chorus, to be conducted by the composer. It was scheduled for the first evening of the event, his 38th birthday, in a programme that included Sergei Rachmaninov playing his Piano Concerto in C minor. ​The Leeds Musical Festival was a four-day event and was held every three years. Vaughan Williams’ ​A Sea Symphony was first mentioned in the Festival’s minutes in July 1909. Initially, the Committee considered offering him a fee of 25-30 guineas but in the event Vaughan Williams asked for and accepted a fee of 20 guineas. 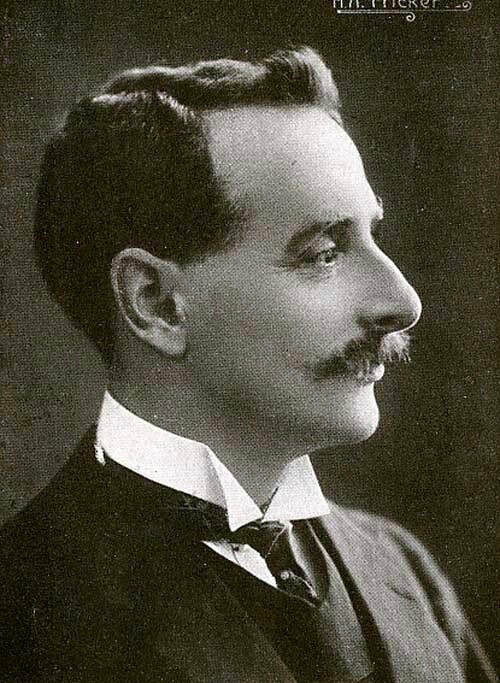 The baritone Campbell McInnes and soprano Cicely Gleeson-White were booked as the soloists for the Festival, McInnes agreeing to a fee of 10 guineas. There were 348 members of the Chorus - 104 sopranos, 92 contraltos, 72 tenors and 80 basses - drawn mainly from Leeds and choirs in Dewsbury and Huddersfield. (Later, after the Festival, it was said to be the finest Chorus that had ever been heard in Leeds.) Choral rehearsals, including sectional rehearsals, took place in Leeds and Huddersfield throughout the spring and summer. The Festival Chorus Master was the borough organist, Herbert Austin Fricker, and it was the Chorus who bore the responsibility for upholding local pride, since the orchestra was made up largely of members of the London Symphony Orchestra and Hallé Orchestra, only seven men being from the local area. Orchestral rehearsals took place in London. With three months to go the conductor, Sir Charles Stanford, and Herbert Fricker were reported to be ‘highly satisfied’ with the progress the Chorus was making. On Saturday 2 July they rehearsed in the afternoon, and the evening rehearsal included the choruses from RVW’s new symphony. By the end of July tickets for the Festival were selling well; ticket prices were one guinea and half a guinea for morning concerts and fifteen shillings and eight shillings for evening concerts. The last rehearsal of the Chorus before the August recess took place at the Philosophical Hall on Wednesday 27 July. Sectional rehearsals resumed in Leeds and Huddersfield at the beginning of September and on the 17th Sir Hubert Parry, Hubert Bath and Dr Vaughan Williams were present to conduct their works at a full rehearsal in the Town Hall. RVW was ‘warmly applauded at the close of the rehearsal of his work, which is the most ambitious one he has composed’. By the 24th September the final edition of the concert programme was with the printer and the concerts that were proving most popular in terms of tickets sold were Elijah and the St Matthew Passion. The list was long of dignitaries who had booked seats - among them the Earl of Harewood (Lord Lieutenant for the West Riding) and his wife; Sir Hugh Bell (Lord Lieutenant for the North Riding); the Duke and Duchess of Norfolk, the Marchioness of Zetland; the Earl and Countess of Londesborough, the Lords Faber, Allerton and Airedale, the Bishops of Ripon, Wakefield and Lichfield and several Members of Parliament. Henry Wood, who had conducted the Bach work at the Sheffield Festival, had bought tickets to hear it performed on the final morning’s concert of the Leeds Festival. A souvenir booklet of the Musical Festival was produced, and was considered well worth the sixpence which was being charged for it. It had photographs of the King and Queen, the Lord Mayor and the Lady Mayoress, officials of the Festival, the principal artists and of course the Chorus, in four separate photos - sopranos, altos, tenors and basses. In the case of the lady members of the Chorus the hats were HUGE ! It was the fashion at the time for women’s hats to be enormous, and it was because of this that a request was included in the Festival programme expressing the hope that ladies would ‘consider the comfort of others by removing their hats before entering the concert-room’. Elsewhere, it was reported that during the rehearsal "some merriment was caused by the collapse of the conductor’s desk holding the full score, and a wag suggested that this was due to “a heavy C”’. The Festival opened on the morning of the 12th with the National Anthem, followed by Elijah, which had been performed many times at the Festival over the years. The Town Hall in the evening, though, "presented a very different spectacle from that seen in the morning. Vacant seats were painfully obvious, and if the other evening concerts are no better attended the prospects of anything like substantial profits will be very small". Vaughan Williams later noted that he believed the work had not been particularly well-received in Leeds. However, newspaper reviews were on the whole favourable. Cecil Bloom, in an article for the Journal of the RVW Society in 2007, offered a summary of many reviews. "The ​Yorkshire Post​ praised the work as being impressive and sincere, showing its composer to have the power to deal with a big canvas and produce music of breadth and grandure. The scherzo was described as a remarkable tour de force and was a piece of virtuosity in choral singing that was rarely heard. The Yorkshire Evening Post felt that the work was too difficult for any except a festival chorus so that it was unlikely it would be performed very often and the Yorkshire Observer found it to be an original and unusual work but added that it needed to be listened to more in order to gain full understanding. It reported that there were several recalls for the composer. The Leeds Mercury called it a remarkable work verging on genius and the slow movement was said to be as fine as anything in music." A Sea Symphony was performed again at the Leeds Musical Festival in 1925 and 1947.